Picture Credit: Room Ideas. Bump out , pastel color, master bathroom vanity. Spring freshness is in your bathroom. After picking up the right backsplash, your bathroom vanity ideas comes next. In this point, you should also consider the sink, vanity top, mirror and lighting, linen cabinets, wall cabinets and shelves, even medical cabinets under the same umbrella. To make the bathroom vanity ideas more understandable, I would like to go for step by step and would like to write about vanity, linen cabinets, shelves and wall cabinets in this article, and I would like to categorize other all in different articles. The most emphasized trio in bathroom vanity ideas is organization, versatility and decoration. Three in one project can only help to solve the dilemma. Your accumulated clutter makes you feel disorganized and you would like to have more space in your bathroom. Then, bathroom remodeling and adding extra spaces are taking places. For all kind of various size of bathroom have different approach of ideas. Your bathroom that needs to remodel may be small, or large. Your bathroom, which needs to be touched, may be your master bathroom, your guest bathroom or kids bathroom. Picture Credit: Archer and Buchanan Architecture. Your guest bathroom warmly welcomes your guests….Open shelve under vanity seems pretty unique. Your house needs to have a taste and follow the style in each room. If you like the traditional taste, your bathroom won’t be contemporary. As I mentioned in kitchen folder, bathroom vanity ideas reflect your style as traditional, vintage, contemporary. The popping up piece of your bathroom is your vanity. Vanity needs to be in contrast with backsplashes to show itself in better way. As a matter of bathroom size, your vanity may be bumped out or, plain surface as front looking. Some vanities are like dresser looking and some are like combination of drawer and cabinets, some has open shelve under. Picture Credit:Jill Litner Kaplan Interiors. Raised middle cabinet with bump out. Eye catcher. The fish design on the vanity doors are very impressive. Picture Credit: Rugo/Raff Ltd. Architects. Curvy bump out vanity , excellent color contrast and neat looking. Usually master bathroom and guest bathroom has wall cabinets in bathroom vanity design ideas. Kids bathroom has always base vanities, since kids cannot reach easily the wall cabinets. Shelve can be used in small bathrooms to give an additional storage and decorative looking, or such a good addition to kids bathrooms. Linen cabinets can be installed over the toilet bowls or next to toilet bowl in small bathrooms, but usually bathroom vanity ideas indicate the best place as close by the bathtub or shower. They are tiny looking cabinets with open shelve or with glass cabinet doors. Wall cabinets with inside drawer are the best solution good organization in bathroom. Medical cabinets embed to the wall are being very old fashioned so, wall cabinets carries the same way of medical cabinets. Wall cabinets are thicker than linen cabinets. 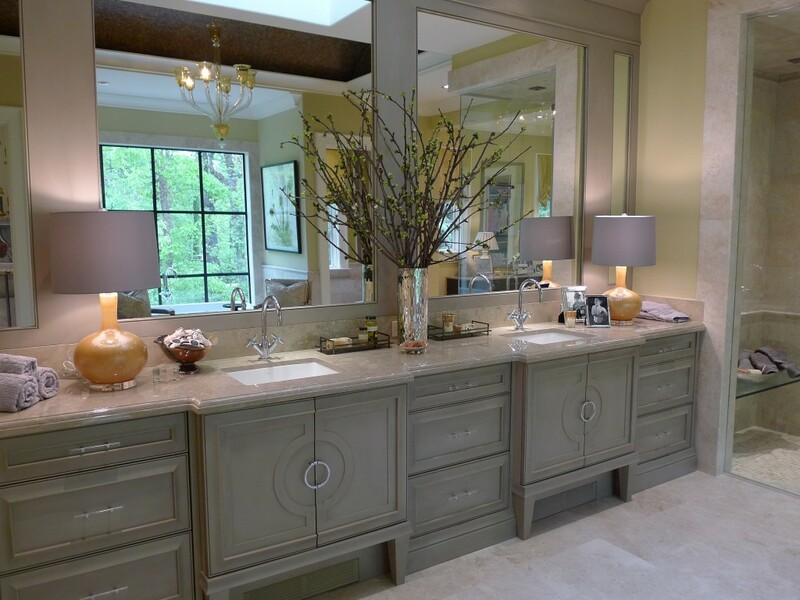 All the cabinets and vanity should be in same color and following pattern in bathroom vanity ideas. In these days two color cabinet and linen can be used as novelty. Hope all information in this article gives you a bathroom vanity idea. Please do not forget to add your comments and stay tune for my next article Vanity Top Ideas.